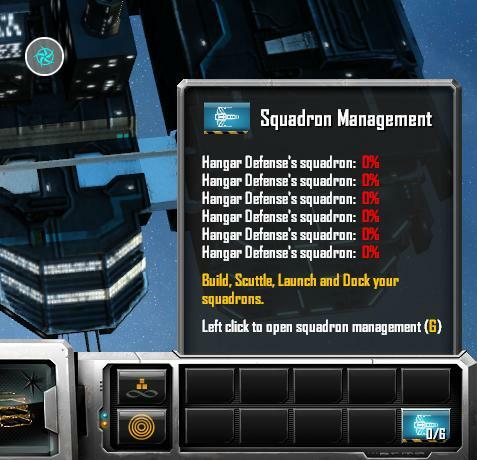 This is a really basic mod that increase the number of fighters/bombers you can build at a planetary defense hangar from 2 to 6 for the TEC and Vasari and from 3 to 9 for the Advent. This should make fighters/bombers play a larger role in planetary offense and defense, adding a different take on some strategies and making it a bit easier to defend a planet adequately with just one or two hangars. Let me know if this is something that interests anyone. You are modding to enable a carrier warfare sort of scenario. I really look forward to that. What most RTS failed to really deliver is meaningful use of firepower and mobility strategies, and then chance and deception. Would you be interested to create a "Battle of Midway" sort of map when you do have the "Wing Commander Mod" done? What DO You Mean By The Mods Menu? I played this mod with patch 1.02 and loved it. My main fleet didn't have to race back and forth between planets to stop small invasions--finally. However two issues-does AI make use of the hangars? I notice a lot of their planets are free for the spanking. **Also-Is it me or does the mod not work with patch 1.03. I keep on getting a memory dump. Cant get Silveressa's other mod to work anymore either. After enabling the mod, I go to pick a map and it says string not found or something. Help!! Love the Mods BTW. Does the mod not work with patch 1.03. I keep on getting a memory dump. Cant get Silveressa's other mod to work anymore either. After enabling the mod, I go to pick a map and it says string not found or something. Help!! Love the Mods BTW. I was a big fan of the Wing Commander game series (and even the movie). Not only do I think this type of MOD is a great idea, but I'd love to see a full conversion Wing Commander MOD using Confed and Kilrathi ships from the series. Origin went belly up a while back so we know we'll never see a new Wing Commander again, but it'd be great to see their torch carried on using Ironclad's engine. More power to you Silveressa, and thank you! Note: This mod HAS been updated to 1.04. Get the new version here: http://hosted.filefront.com/Silveressa (It;s listed as more hangar space 104.zip. The More Hangar Space link in FileFront.com is not working. Where else can I download this mod? Version 1.05, this mod still hasn't been updated, please do so or provide instruction how we could do so ourselves. A new version for 1.12 & entrenchment is coming soon, pc issues + real life obligations have taken me away from the mod scene for a lengthy time. The Newest version has been uploaded that is fully compatible with 1.12 Either download it here or from file front xxxxxxxxxxxxxxxxx http://files.filefront.com/More+Hangar+Space+112zip/;13052607;/fileinfo.html When Entrenchment gets released I'll re-release a compatible version of this mod for the expansion if needed. Sins updated to 1.13. Mod still only running at 1.12. Probably isn't worth fixing until Entrenchment comes out.